Simply reaching the playoffs probably won’t be enough to satisfy the 76ers. But in order to emerge as the last men left standing in the Eastern Conference - the team’s stated training camp goal - the club still had to punch a ticket to the dance. And if there were any way to make a splash into the postseason for a second straight year, Sunday afternoon’s 130-125 win in Milwaukee was a pretty good place to start. Why don’t we address this basic truth first - the Sixers wrapped up their berth by beating the best team in the NBA on its own floor. Only five times previously this season had the Bucks, a league-leading 51-18, fallen at sparkling new Fiserv Forum, which, for Sunday’s nationally televised matinee, drew a record sellout crowd of 18,184. The loss also marked just the ninth for Milwaukee against a fellow foe from the East. Now, let’s peel back a few more layers to the Sixers’ impressive season-high tying fourth victory in a row. If you happened to be wondering whether one of the franchise’s brightest stars would deliver in a primetime (figurative, not literal) pairing with an elite opponent, you didn’t have to wonder very long. From start to finish, Joel Embiid was sensational in every sense. In his first outing as a 25-year old, he went for 40 points, 15 rebounds, and six assists. The only other time he’s tallied those statistical minimums was in last season’s epic display at STAPLES Center, where he tore apart the Los Angeles Lakers. There was more to Embiid’s monstrous effort Sunday than statistics. For the bulk of the first through third quarters, he was the initial defender assigned to MVP-candidate Giannis Antetokounmpo, and you know what? The 7-footer showed he could hang, helping throw the Freak and the Bucks offense out of rhythm in the first half just enough to allow the Sixers to seize control. Some people might have drawn attention to the fact that Embiid shot 4 for 13 from outside the arc. We would then counter by saying who knows how the game would have ended up had he not taken - and made - his 13th perimeter attempt. The straightaway dagger lifted the Sixers’ lead to 123-116 with 35.6 seconds to go, essentially putting Milwaukee’s comeback bid on ice. 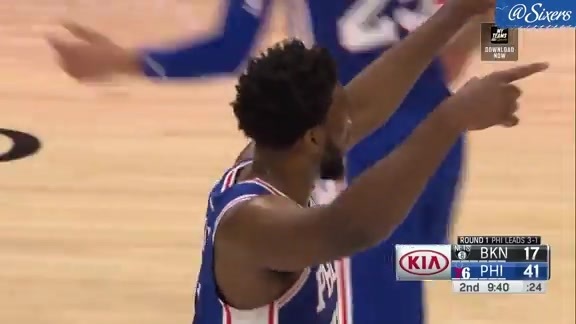 As essential as Embiid was Sunday, Jimmy Butler was particularly vital to getting the Sixers’ across the finish line. He burst for 14 of his 27 points in the final five minutes of regulation, a surge highlighted by a tough floater in traffic that widened the gap to 13 with three minutes left. JJ Redick (19 pts), meanwhile, got the Sixers off on the right foot. He knocked down a couple of contested 3-pointers in the opening quarter, buried his first four threes overall, and shot freely and with confidence the whole day. ...and another authoritative jam in the fourth period. In respect to the Sixers’ starters, we won’t leave out Tobias Harris (12 pts, 7 reb, 4 ast), either. He strung together an important second quarter flurry that moved the margin to a game-high 14 points. Ever since signing on as the Sixers’ head coach in August of 2013, Brett Brown has been steadfast in his approach. Yes, from a technical standpoint, he wants the team to play a certain way. More than that, though, Brown has always maintained that his system has to be capable of absorbing talent. We’re currently seeing signs of the philosophy at work. 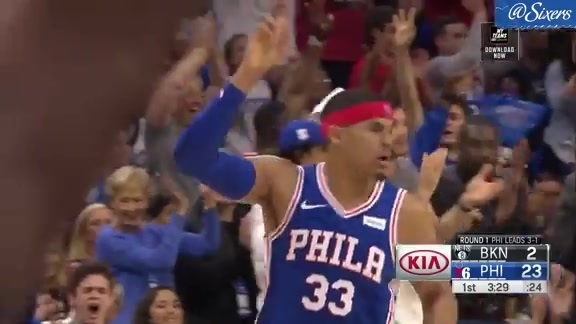 A season ago, the Sixers enjoyed a memorable ride to the second round of the playoffs that was spearheaded largely by a mostly homegrown nucleus that had long been in incubation. This year, as Brown has described it lately, the team is on the third version of itself. Sunday was the seventh game of Sixers’ 3.0, a version of the roster that accounts for the mid-season additions of both Butler and Harris (along with the Sixers’ other veteran trade deadline acquisitions). Yet despite the small sample size, flashes of great promise have been ever present. The win over the Bucks was further proof.